Many C/C++ functions return data in the form as a pointer (or reference) to the memory address that holds the actual data. Programmers get the value at the memory address by ‘dereferencing’ the pointer. However, since LabVIEW hides memory management from the user, LabVIEW users need another mechanism to ‘dereference’ the pointer. Note: Some simple data types like numerics and simple structs can automatically be dereferenced in the Call Library Function Node itself. For details, refer to the section titled Receiving Pointers and Automatically Dereferencing in Passing and Receiving Pointers with C/C++ DLLs from LabVIEW. MoveBlock is a Memory Manager Function that takes a memory address and returns the data at that memory address. The MoveBlock function allows you to control how many bytes to read as well as the datatype to convert the data to. Because of its low level control, you can in essence dereference any type of data, from simple numerics to complex structs that contain arrays of structs within it. In order to use MoveBlock, wire in the pointer to the Address input, a constant/control of the same data type as the value being dereferenced to Destination, and the size of the data type (in bytes) to Size. 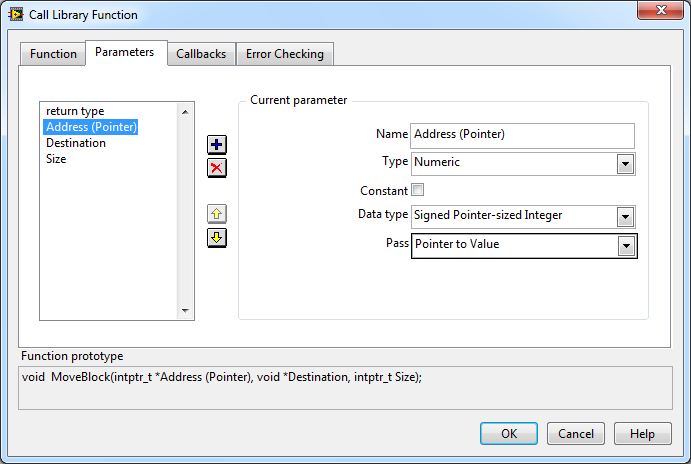 GetValueByPointer is a VI that encapsulates some of the complexity of using MoveBlock and will automatically adjust its operation based on the data type wired to it. While it is simpler to use, it does not automatically dereference arrays or structs (clusters) that contain arrays. Elements in arrays need to be dereferenced individually. To use the VI, wire in the pointer to Pointer, a constant/control of the same data type as the value being dereferenced to InputType. Array variables in C/C++ are actually pointers that point to the first element of the array. Because of this, when a function returns an array, it is really returning a pointer to the array. 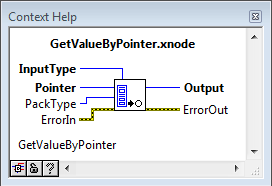 To dereference a pointer to an array you can use either MoveBlock or GetValueByPointer. Strings in C/C++ are actually arrays of type char. So string variables are really pointers to the first character in the string. Because of this, when a function returns a string, it is really returning a pointer to the string. To dereference a pointer to a string you can use either MoveBlock or GetValueByPointer, however it is easier to use GetValueByPointer as you do not need to know the length of the string beforehand. 2D arrays are represented as an array of arrays. Since an array is really a pointer, a 2D array is a pointer to an array of pointers, where each pointer points to the individual rows of the array. 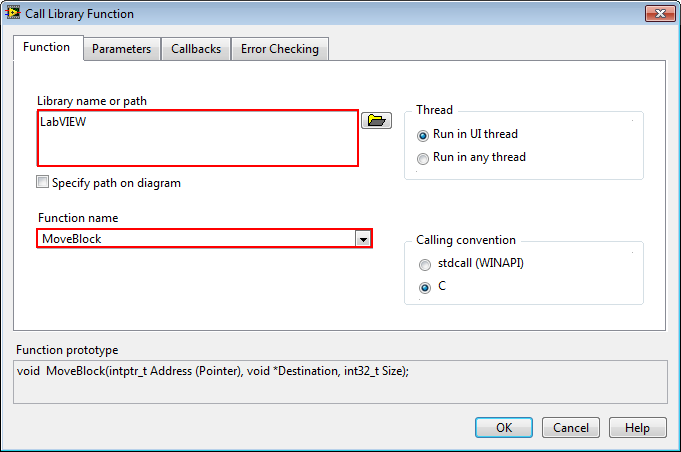 You have seen two methods to dereference pointers in LabVIEW. The GetValueByPointer VI is simpler to use, however has limitations with automatically handling arrays and structs with arrays. The MoveBlock function is lower level and allows you full control over dereferencing pointers, however is slightly more complex to use. is not really an array of pointers but simply a pointer to a memory block containing 6 * 6 elements. 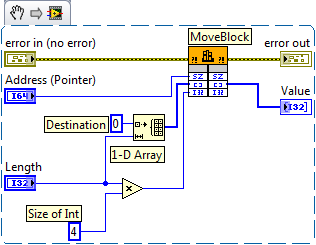 It is also how LabVIEW treats arrays, as a single contiguous block of memory containing all the elements. C is a bit ambiguous about multidimensional arrays, as there does not really exist a clear syntax that distinguishes the single block multi dimensional array and the array of pointers. It's the choice of the implementer how he wants to represent multi dimensional arrays in memory, and a user of such a function has to comply to that choice. 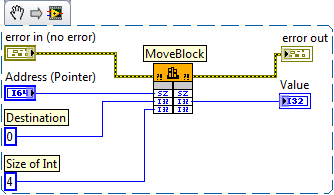 The MoveBlock example is confusing and incorrect. The address parameter should be passed by value, not by pointer, since the user already has the address value on a wire (returned from a DLL, presumably). How do I send a pointer to a .net function, (array pointer input)? is it the same MoveBlock function? but how do I use it? This question would be better posed on the forum, after a search there to see if your question has already been answered. Please add more details in your post, including any documentation of the .NET interface you're using. It is unusual to pass a raw pointer to a .NET component; it would be more common to pass a .NET array. There are posts on the forum explaning how to create a .NET array in LabVIEW and pass it to an external component.